Please remember - its a protoype: so some values values or images are hardcoded or its not very handly or buggy! Important for you: I would like to hear your feedback, but there won't be any updates (for bug fixes and features updates, except its a heavy bug). That is my part for this christmas - have fun and it's time to buy gifts! The last one prototype of this year is very handy, if you need new bodies for a lot of frames, e.g. new character etc. 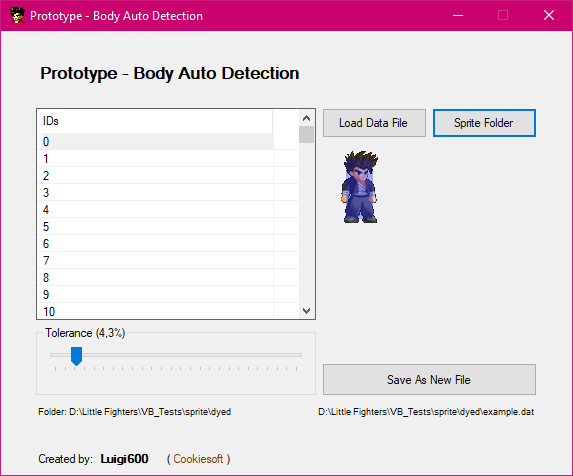 This prototype generates all bodies and save it in a new file. Greetings, I've been wondering how the program determines the area of the bdy and how the tolerance is factored in? (12-24-2018, 06:13 PM)Ramond Wrote: Greetings, I've been wondering how the program determines the area of the bdy and how the tolerance is factored in? I don't want to explain it in detail, but it works with the amount of pixels and the ratio. Tolerance means: how many pixels can be removed from total amount. Wondering if a future iteration can do multiple bdys for like diagonal positions? ? unless it already does that, I haven't used it yet or anything ? (01-10-2019, 07:28 PM)bashscrazy Wrote: WOW REALLY COOL! Current time: 04-19-2019, 07:50 AM Powered By MyBB, © 2002-2019 MyBB Group. Theme created by Silverthorn.